The Town of Dundee Adopted 2030 Comprehensive Plan is the overarching policy document that guides the Town’s approach to growth management. It articulates the vision of the community as to what its citizens want it to become in the future. It identifies the goals the community aspires to reach as it grows and is a document that will guide policy decisions about growth and change. The Comprehensive Plan includes principles, guidelines, and standards for the orderly and balanced economic, social, physical, environmental, and fiscal development of the Town through 2030. It encompasses all the functions that make a community work such as transportation, housing, land use, infrastructure, and recreation. 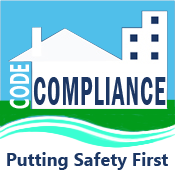 All development orders or land development regulations are required to be consistent with the Comprehensive Plan. The State of Florida regulates the adoption of the Comprehensive Plan under the Local Government Comprehensive Planning and Land Development Regulation Act. 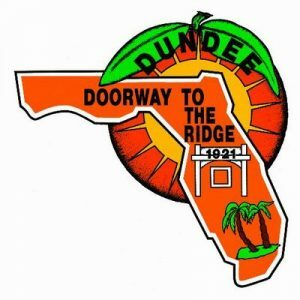 The Town of Dundee is required to evaluate their comprehensive plan at least once every seven years only to determine if plan amendments are necessary to address changes to new state requirements. The Town notifies the State Land Planning Agency by letter of its determination. The Elements of the Plan include Future Land Use, Transportation, Housing, Infrastructure, Conservation, Recreation and Open Space, Intergovernmental Coordination, Capital Improvements, Public School Facilities, and Definitions. 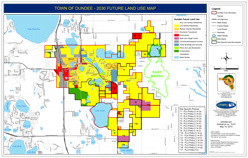 The Future Land Use Map is a part of the Comprehensive Plan and with the descriptive text of the Future Land Use Element, directs the type of use and density or intensity of use for property within the Town. The Zoning of property must comply with its Future Land Use designation. Changing the Future Land Use designation of a property requires an amendment to the Comprehensive Plan. A property’s Future Land Use designation is determined by locating your property on the Future Land Use Map or by contacting the Planning Department. If requested, the Town will issue a letter confirming the Future Land Use Classification of a property. The property’s tax parcel identification number (PIN) or address must be provided to determine the future land use designation. What are the Types of Future Land Use or Comprehensive Plan Amendments? There are three types of Comprehensive Plan Amendments: Small Scale, Expedited State Review, and State Coordinated Review. Small Scale Amendments are requested changes to the FUTURE LAND USE MAP that involve land area 10 acres or less in size. Application for a Small Scale Amendment can occur at any time throughout the year. Processing a Small Scale Amendment takes approximately 3 months, or about half the time required for a Large Scale Amendment, because a Small Scale Amendment is exempt from the lengthier process of review by the State Land Planning Agency (see 163.3187 F.S.). A Small Scale Amendment requires a public hearing before the Local Planning Agency (Planning and Zoning Board) and two public hearings before the Town Commission. Upon adoption, a copy of the amendment is submitted to the Department of Economic Opportunity. Expedited State Reviews (Large Scale Amendments) are requested changes to the TEXT of the Comprehensive Plan OR requested changes to the FUTURE LAND USE MAP that involve land area greater than 10 acres. Processing an Expedited State Review Amendment takes approximately 4 to 6 months to complete the process of review by the State Land Planning Agency (see 163.3187 F.S.). An Expedited State Review Amendment requires a public hearing before the Local Planning Agency (Planning and Zoning Board) and two public hearings before the Town Commission. Upon adoption, the Town submits a copy of the amendment to the Department of Economic Opportunity. Amendments become effective 31 days after the Department of Economic Opportunity determines the adopted amendment package is complete (subject to no Petition being filed by an affected party). The State Coordinated Review Process is utilized for Comprehensive Plan amendments that are in an area of critical state concern, amendments that propose a rural land stewardship area, amendments that propose a sector plan, or amendments that update a comprehensive plan based on an Evaluation and Appraisal Report. A State Coordinated Review Amendment requires a public hearing before the Local Planning Agency (Planning and Zoning Board) and two public hearings before the Town Commission. The Florida Department of Economic Opportunity reviews and may comment on the amendment prior to the second reading before the Town Commission. There is no set schedule for submitting comprehensive plan applications. What is the Difference between Future Land Use and Zoning? Future Land Use designations indicate the intended use and development density for a particular area, while zoning districts specifically define allowable uses and contain the design and development guidelines for those intended uses. The Dundee Comprehensive Plan may allow (but not guarantee) various zoning districts within a given future land use designation. If an owner desires to use or develop property in a manner that does not conform to the current future land use designation, they must apply for a future land use amendment, which may accommodate an application for rezoning. The applicant should demonstrate that the proposed future land use amendment is consistent with the Dundee Comprehensive Plan. Future Land Use Amendments require a public hearing before the Local Planning Agency (Planning and Zoning Board) and two public hearings before the Town Commission. Some applications may require a rezoning, which can be processed in conjunction with a future land use amendment request.